An obvious question might be: Why Desertification / Why Groundwater Degradation? Awareness of rising CO2 levels in the atmosphere, rapidly melting icecaps, ozone depletion and global warming are now at the forefront of conversation and thinking. Desertification is, if anything, a confusing and unknown term to many as is the inter-relationship between it and the depletion and contamination of the relatively small amount of freshwater on the planet. 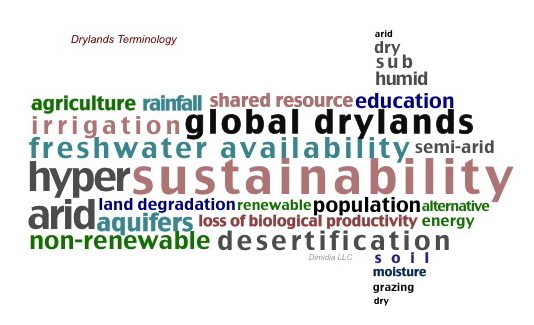 To get you visually focused on the global issues associated with dryland and freshwater degradation, I offer this composite graphic. He thought of desertification as the changing of productive land into a desert as the result of ruination of land by man-induced soil erosion. Desert of Desertification? There is a Difference. An important point to understand is that desertification is less about deserts and more about drylands. A common misunderstanding about desertification is that it spreads from a desert core, like a ripple on a pond. The truth is that land degradation can and does occur far from any climatic desert. The presence or absence of a nearby desert has no direct relationship to the process of desertification. Drylands are far from being infertile areas. They are just more delicate – like when organic matter is readily washed or blown away. Desertification usually begins as a spot on the landscape where land abuse has become excessive and natural regeneration is lacking. From that spot – which can most often be found near areas frequently used in human activities: a watering point, a cultivated field, a pastoral grazing area, a village, land degradation begins to spread outward as this negligence continues. Soil salinization – a process in which the salt content of soil accumulates over time to above normal levels often associated with improper irrigation methods in arid regions – is just one of several processes that contribute to desertification. A second misconception is that droughts are responsible for desertification. In fact, the very definition of drylands correlates to varying amounts of moisture. Droughts do increase the likelihood that the rate of degradation will increase on non-irrigated land if the carrying capacity is exceeded. However, well-managed land will recover from droughts with minimal adverse effects when ample rainfall eventually returns. The deadly combination is land abuse during good periods and its negligence during periods of deficient rainfall. So, let’s gets back to the original question of Why Desertification. Drylands are an important global biome, constitute about 41% of the Earth’s surface and support nearly 25% of the earth’s population. About 44% of all cultivated systems world­wide are located within drylands. More people in drylands – than in any other ecosystem – depend on ecosystem ser­vices for their basic needs. Crop production, livestock and dairy production, growth of fuelwood, and construction materials all depend on plant productivity, which in drylands is constrained by water availability. Cultivated lands are a substantial part of the dryland landscape. There is little question that the tropics appear to be growing further in size – expanding further north and south from the equator. The impact of that shift will continue to have a more significant influence on global weather patterns and, ultimately, upon global agriculture and meat production. As areas of impact on each continent continue to be more greatly affected, the quality of our global ecosystems will continue to worsen. Although dryland territories in at least 100 countries are prone to desertification, including developing countries in Africa, Asia and Latin America, as well as in many developed countries (like Spain, USA, Australia), it is the poorest countries that suffer most and have the highest proportion of impacted dryland area. Climate stability is one factor that influences the conditions for desertification. Unsustainable and archaic irrigation practices are others. Increasing populations is another. As global environmental challenges increase in magnitude, inhabitants must make decisions about whether the impact is temporary or will likely be more enduring. Nearly all water on Earth is contained in the oceans, leaving only 2.5 – 3.0% as freshwater. Of this small percentage, nearly three quarters is frozen. Most of the remainder is present as soil moisture or lies deep in the ground. The principal sources of freshwater reside in lakes, rivers, wetlands, and shallow groundwater aquifers—all of which make up but a tiny fraction (tenths of 1%) of all water on Earth. This amount is regularly renewed by rainfall and snowfall and is therefore available on a sustainable basis. Groundwater depletion and degradation (pollution) are becoming all too extensive. More and more regions of each continent are being affected by more frequent and more prolonged periods of severe weather phenomena combined with increasing populations and resource depletion. Conflicts between pastoralists and agriculturalists have multiple causes. Drought and desertification often trigger many conflicts as a result of competition over water points and key grazing resources. Displacement of communities and competition over access to land and other productive resources is most frequently a source of conflict when communities move into areas of a different ethnic group or across national borders between countries. The world’s declining drylands have a significant impact on climate change and climate change is having a significant impact on the quality and resilience of global drylands. Increasing populations contribute greatly to this impact. The global population has recently reached 7 billion people – more rapidly than projected just a few years ago! The expectation that the global population will reach 9 billion by 2050 is now likely to occur sooner than expected. Together, these factors are destabilizing population centers in developing countries and will lead to increases in migration. 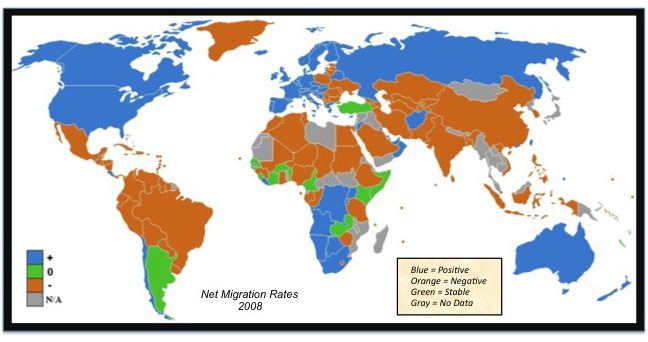 Unfortunately, this migration is most often forced than voluntary. It is becoming evident that it is no longer important about whether this migratory movement can be attributed to environmental factors alone. Global attention and focus are required now and will be required well into the future! Who gets the water and who really owns environmental stewardship ultimately affects not just the enforcement of sustainability necessities, but the realization that declining environmental quality is likely to only worsen into the future – beyond the obvious conditions we can see to the darker reserves of karsts and aquifers – as humans tunnel deeper into the earth in search of hidden resources. Very soon, the question will be much greater than simply restrictions on how we use environmental assets. It will be the realization that our global resources may be insufficient for most people to survive. These are just some of the facts. There is no single silver bullet to fix these threats. Ultimately, these problems will affect each of us as population continues upward and the world becomes more and more global – from services to manufacturing to agricultural production.